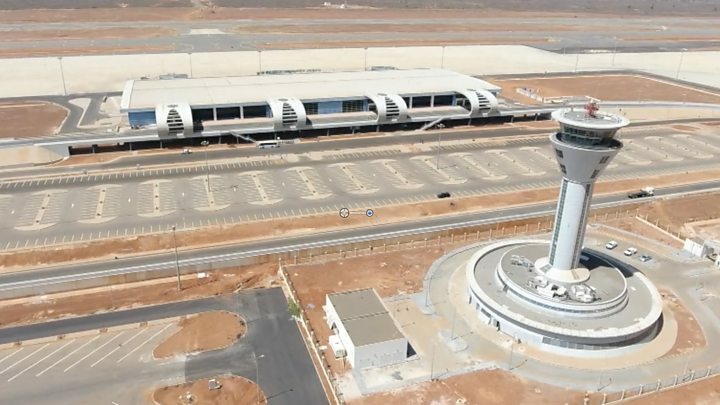 Flights at the new Dakar international airport in Senegal have been disrupted by an air traffic controllers' strike, just a week after it opened. The 24-hour strike, which began at midnight GMT on Thursday, is about working conditions. Hundreds of passengers have been affected. Several flights have been cancelled, others were re-routed to The Gambia. The Blaise Diagne International Airport cost more than $600m (£450m) to build, replacing an ageing facility. "There is no information. That's the worst part. We would like to know when the strike will end. Then we can decide what to do next. My parents back home are worried." 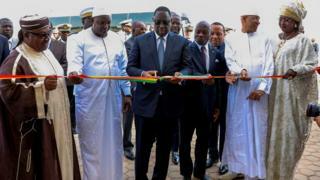 Media captionSenegal's new airport is 50km from the capital Dakar - why?